Personal Note: This story was especially important to Tom and Janet Crago because Saratu’s goat herd got its beginning in 2007 with a donation of $100 from Florence Crago, Tom’s mother, who was moved to help a widow in Nigeria when she heard her story. It was Oct 3, 2014. They first came as thieves, and were dressed as soldiers. They surrounded the whole village of Gavva East. Saratu and her mother were at home. It was 8 o’clock in the morning and Saratu was taking her bath. When they started firing their guns, the sound of gunshots came from all over the village. Everyone started running for the mountain. The Boko Haram insurgents killed some people and kidnapped many women and children that day. Saratu was one of the lucky ones. Her mother was with her and they were fast enough to run and escape captivity. Saratu tells of gunshots passing very close to her and how panicked she felt. She ran until she thought she would burst from lack of breath. It is a steep climb up the mountain. After that day, the Christians from Gavva East did not return to live in their village. They were too frightened. They stayed on the mountain. They didn’t want to leave their home area and were hopeful that the Boko Haram had gone away for good. This area of northeast Nigeria has had a very lucrative farming history. They grow guinea corn, sesame seed, and onions. But the Boko Haram were persistent in their aim of driving Christians from the area. They came again on Oct 14, 2014. They dressed in football (soccer) uniforms and pretended they were Christians. They told everyone to come out and that it was safe, but the ones who came out were killed or captured. Many more women and children were kidnapped. The men were killed. The word spread that the Muslims from Gavva East went to the Sambisa forest and joined Boko Haram. So, the neighbors and former friends of Christians in Gavva East had now become their enemies who were trying to kill them or drive them away from their homeland. The Boko Haram insurgents came back to the mountain hideaway on Oct 24, 2014. They came from all directions around the mountain and surrounded it. Saratu and her mother hid in a small cave. The Boko Haram spent one week of relentless searching by surrounding the mountain and calling out to people to come out. They would cry out every day saying, “Come out, come out, you will not be killed if you convert to Islam”. But if you refused to convert they would slaughter you (cut your throat) and throw pieces of your body into the community’s mountain spring water source. They spoiled the water for everyone. Saratu and her mother never came out. They remained true to their Christian faith. They stayed hidden while trembling with fear. They refused to convert. During this horrible week of intense fear, other insurgents were in the village of Gavva East looting houses. They took away everything valuable, including the zinc roofs of the houses. Then they set fire to the Christian homes. It was a very difficult week. The Christians in hiding would come out in the dead of night to search for a way to Cameroon. Finally, they left on their trek to Cameroon. Because they didn’t have water, they kept their eyes open for wet spots on the ground. When they spotted a wet site, they would dig down until water started filling the hole. When the water filled the hole enough, they would drink the water. 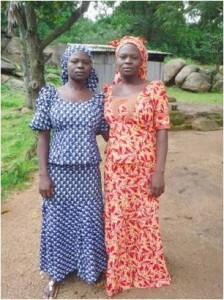 They did not eat for a week on this trek to Cameroon. Survival in the Cameroon, too, was difficult. The town where they went was predominantly Islamic. They discovered that if they could do a little work for a Muslim home, they would be given a little money for food. At one point, a Muslim man who took passengers to Yola told them that he would take them to Yola for 5,000 Naira ($25) each, but he just took their money and disappeared. Many others fell for this trick as well. Finally, Saratu and her mother were able to arrange transport for the two of them to be taken to Yola for 18,000 ($90) each. Saratu’s father was able to send them the money. When they got to Yola, it was easy to arrange transport back to Maiduguri. By that time, Saratu’s girls had not heard from their mother for 6 months. They had lost hope that she was still alive. when Saratu was just 27. Walla and Wassa are her oldest children and twins. They are attending university. 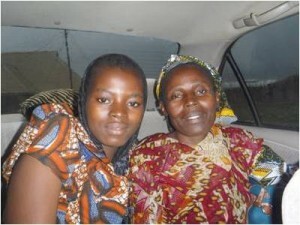 Rita has just completed secondary school and is staying with an uncle. Her youngest, Renate, is attending boarding school. Saratu left 22 goats behind when she had to flee. Losing her goats was a big concern because she was using the money from the sale of goats to pay for her girl’s school fees. They also gave her a source of protein for her own family. Saratu is now about the business of recovery. She recently got a job at the Center for Caring and Empowerment Initiative (CCEPI) in Jos, run by Dr. Rebeccah Dali, the wife of EYN’s President. She is very happy to have work again. Before her escape, she had been employed by the Literacy program in Gavva. This program was a function of EYN providing much needed education in the Gavva area. That program doesn’t exist any more because all Christians have had to leave the area and all the buildings have been destroyed. The Christians of Gavva East are still mourning the loss of the Literacy program. They now have to focus on moving on with their lives in another area. Please pray that God will bless them in their new workplaces and that their industry and Godliness will have a huge influence in the new place. This entry was posted in Nigeria and tagged Boko Haram, Ekklesiyar Yan’uwa a Nigeria, EYN, Nigeria, nigeria crisis, Peace, prayer by Roxane Hill. Bookmark the permalink.